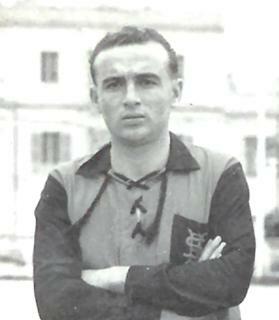 Ġużi Buttigieg was Ħamrun’s hero in the 1948-49 Cassar Cup final. At the start of the 1948-49 season, the Services withheld permission for Maltese Service personnel to play for their civilian clubs. This was something the Services did from time to time. However, to prevent all the Service players from playing football at a time when many Maltese were still in uniform was nothing less than a death sentence to the game. Many attempts were made to break the deadlock and it was only after the intervention of Carmelo Scicluna, the stadium owner, that the players were given the choice to represent either their Services team or civilian club. This, however, was not much of a choice because many of those concerned were not ready to quarrel with the ones who were paying their wages. The plans for the new season were interrupted and the league, which was to start on October 2, 1948, had to be postponed to allow more time for negotiation. At the end, the Services relented and gave their permission to the players to take part in civilian football but reserved first right on the player. This ban did not affect the clubs in the league and FA Trophy because Service teams did not participate in these competitions. However, in the Cassar Cup and representative matches, civilian clubs were placed at a great disadvantage. Sliema Wanderers and Ħamrun Spartans found themselves with their backs to the wall when they met the Navy and Army teams respectively in the Cassar Cup semi-finals. The ban on Service players undermined both teams. They tried to make up for this with guest players but this was not the same as using one’s own. The Cassar Cup semi-finals were played over the weekend of May 1 and 2. The Navy, with a team composed of only English players, sprung a surprise when they beat league champions Sliema 2-1. The Wanderers never looked like losing but the sailors struck two quick blows in the first period and then put up a stout-hearted defence in the second period. Holmes, in goal, was in great form and it was mainly thanks to him that the Wanderers were thwarted from reaching the final. The next day, Ħamrun faced an Army team made up almost entirely of RMA players. The Army, champions and cup winners, had a formidable team at the time. Still, the Spartans were not in awe of their opponents. They shared play and after a somewhat even first half, forced the pace after the break. At the end of the 90 minutes the score was even at 2-2 and although extra-time was played, it remained unchanged. The match was replayed on May 4 but what promised to be a first-class game was marred by poor refereeing. There was no doubt that Ħamrun deserved to win but the 4-0 score did not reflect the run of play. Some strange decisions by referee Walter Gatt, however, made things difficult for the Army team on the day. At least, on two occasions the soldiers were denied clear-cut penalties which, had they been given, would surely have altered the course of the game. Fortunately there were no controversies in the cup final. Ħamrun made short shrift of the feeble challenge put up by the Navy. The Spartans won the contest5-1 and their devastating form literally swept their opponents off their feet. Ħamrun could have won by a wider margin had the woodwork not come to the aid of goalkeeper Holmes. All the Spartans players performed admirably but the best was surely Ġużi Buttigieg, who scored four of the goals, and the inspirational Romeo Vassallo. At the end, both players received a huge cheer from the crowd as they stepped up to receive their medals.